L’équipe est impliquée dans l’élaboration d’architectures moléculaires possédant des états à séparation de charge de longue durée de vie. Ces systèmes incluent des complexes hétéro-poly-nucléaires (V. Marvaud) et des POMs photosensibilisés dans le visible (G. Izzet, A. Proust). En raison des propriétés de réservoir d’électrons des dendrimères et des POMs, nous sommes particulièrement intéressés par la photo-accumulation de charges qui est une étape clé pour l’élaboration de dispositifs moléculaires photoélectrochimiques permettant la conversion d’énergie lumineuse en énergie chimique. Une attention particulière est également portée aux transferts d’énergie/électrons (effet d’antennes) au sein de ces composés. L’intégration de ces composés photoactifs dans des dispositifs photovoltaïques ou photoélectrocatalytiques constitue un des objectifs de cet axe de recherche. L’élaboration de cellules photovoltaïques organiques (OPV), principalement à base de dérivés oligothiophènes est également développée au laboratoire (L. Tortech). Nos efforts s’orientent principalement selon 2 axes : 1/ synthèse de molécules (in-)organiques originales et leur intégration dans la couche active du composant et 2/ élaboration de couches interfaciales. L’objectif commun de ces deux axes réside dans l’amélioration des connaissances dans les processus opto-électronique (transfert de charges aux électrodes par exemple) mais également dans l’augmentation des performances photovoltaïques. Mots clés : photosynthèse artificielle, antennes dendritique, POMs photosensibles, cellules photovoltaïques organiques, films minces. F. A. Black, A. Jacquart, G. Toupalas, S. Alves, A. Proust, I. P. Clark, E. A. Gibson*, G. Izzet,* Chem. Sci., 2018, 9, 5578–5584. Controlled design of photoactive hybrids would provide highly active materials for solar energy conversion and photo(electro) catalysis. We describe the kinetics of photoinduced electron transfer in a series of photoactive hybrids based on Keggin-type polyoxometalates (POMs) covalently grafted to bodipy photosensitizers. We show how the electronic properties and corresponding dynamics of these hybrids can be readily tuned by varying the POM metal ion, the anchoring functionalization and the spacer length. Ultrafast visible and IR transient absorption spectroscopy, supported by spectroelectrochemical measurements, reveals that photoinduced electron transfer from the bodipy chromophore to the organosilyl POM derivative occurs as rapidly as τ = 54 ps to generate a long-lived (τ = 4.8 ns) charge- separated (CS) state, making this system appropriate for applications in photoelectrochemical devices. E. Rousset, D. Chartrand, I. Ciofini, V. Marvaud, G. S. Hanan, Chem. Commun., 2015, 51, 9261-9264. A high-temperature, microwave synthesis of [Ru(qpy)3]2+ (qpy = 4,4′:2′,2′′:4′′,4′′′-quaterpyridine) affords the photosensitiser in quantitative yield. The complex produces H2 photocatalytically in a range extending from the UV region of the spectrum to the red with greater efficiency when compared to [Ru(bpy)3]2+. M. Alaaeddine, Q. Zhu, D. Fichou, G. Izzet, J. E. Rault, N. Barrett, A. Proust, L. Tortech, Inorg. Chem. Front. 2014, 1, 682–688. Wells–Dawson polyoxometalate K6[P2W18O62] is grown as an interfacial layer between indium tin oxide and bulk heterojunction of poly(3-hexylthiophene) (P3HT) and [6,6]-phenyl-C61-butyric acid methyl ester (PCBM). The structure of the POM layers depends on the thickness and shows a highly anisotropic surface organization. The films have been characterized by atomic force microscopy and X-ray photoelectron spectroscopy (XPS) to gain insight into their macroscopic organization and better understand their electronic properties. Then, they were put at the anodic interface of a P3HT : PCBM organic solar cell and characterized on an optical bench. The photovoltaic efficiency is discussed in terms of the benefit of the polyoxometalate at the anodic interface of an organic photovoltaic cell. B. Matt, J. Fize, J. Moussa, H. Amouri, A. Pereira, V. Artero, G. Izzet, A. Proust, Energy Environ. Sci., 2013, 6, 1504-1508. Steady-state irradiation under visible light of a covalent Ir(III)-photosensitized polyoxotungstate is reported. In the presence of a sacrificial electron donor, photolysis leads to a very efficient photo- reduction of the polyoxometalate. Successive formation of the one- electron and two-electron reduced species, which are unambiguously identified by comparison with spectroelectrochemical measure- ments, is observed with a significantly faster rate reaction for the formation of the one-electron reduced species. The kinetics of the photoreduction, which are correlated with the reduction potentials of the polyoxometalate (POM), can be finely tuned by the presence of an acid. Indeed light-driven formation of the two-electron reduced POM is considerably facilitated in the presence of acetic acid. The system is also able to perform photocatalytic hydrogen production under visible light without significant loss of performance over more than 1 week of continuous photolysis and displays higher photocatalytic efficiency than the related multi-component system, outlining the decisive effect of the covalent bonding between the POM and the photosensitizer. This functional and modular system constitutes a promising step for the development of charge photo- accumulation devices and subsequent photoelectrocatalysts for artificial photosynthesis. B. Matt, X. Xiang, A. L. Kaledin, N. Han, J. Moussa, H. Amouri, S. Alves, C. L. Hill, T. Lian, D. G. Musaev, G. Izzet, A. Proust, Chem. Sci., 2013, 4, 1737-1745. 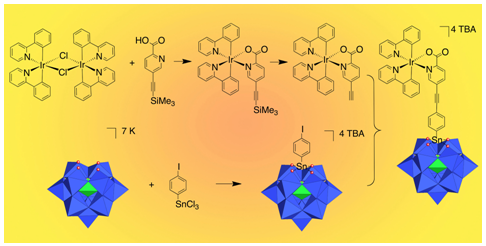 Keggin and Dawson-type polyoxometalates (POMs) covalently grafted to heteroleptic cyclometalated iridium(III) complexes (POM-[Ir] dyads) have been prepd. by postfunctionalization of organosilyl and organotin POM derivs. Electronic properties of these 4 photosensitized POM-[Ir] dyads were evaluated by electrochemical measurements and theoreticals calculations. These studies reveal that the electron acceptor character of the POMs vary with structural class (Keggin vs. Dawson) and chem. anchorage (organosilyl vs. organotin) ; they reveal the poor electronic interaction between the POMs and the chromophores. Combined transient absorption and spectroelectrochem. measurements provide evidence for the formation of photoinduced electron transfer from the chromophore to the POM. The lifetimes of the charge-separarated states (ranging from ns to hundreds of ns) are the longest values reported for covalently bonded photosensitized POMs. The functionalization of the heteroleptic cyclometalated iridium(III) on the picolinate ligand provides directionality to the photoinduced electron transfer by enhancing charge sepn. and delaying charge recombination The kinetics of the photoinduced electron transfers are rationalized by Marcus theory. We conclude that the charge separation and charge recombination respectively occur in the Marcus normal and inverted regions. B. Matt, J. Moussa, L.-M. Chamoreau, C. Afonso, A. Proust, H. Amouri, G. Izzet., Organometallics, 2012, 31, 35-38. A novel heteroleptic cyclometalated iridium(III) complex with one picolinic acid derivative bearing a pendant terminal alkynyl tether has been prepared following a new synthetic route. This pendant alkynyl tether can be further engaged in palladium C-C coupling reactions, allowing its grafting to a Keggin-type polyoxometalate and thus providing a unique iridio-POM conjugate. 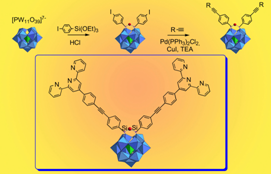 Keggin and Dawson-type polyoxometalates (POMs) decorated by organometallic [cyclometalated ruthenium(II) polypyridine complex] or organic (pyrene) chromophores were prepared by postfunctionalization of hybrid disilylated POM platforms. The connection is made in a very efficient and modular way via Sonogashira coupling reactions, which provide a rigid linkage between the POM and the photoactive centers. Electronic properties have been inferred from electrochemical and photophysical studies and reflect poor electronic interactions between both partners. The presence of the POM leads to luminescence quenching of the chromophores, which was attributed to an intramolecular electron transfer from the chromophore to the POM. The rate of this process is much faster in the POM-pyrene than in the POM-Ru system. It depends on the driving force dictated by the redox potentials of both partners but also in the case of the POM-Ru system on the presence of the metallacycle, which acts as a molecular insulator and delays the intramolecular electron transfer. In the POM-Ru system, a comparative study of the luminescence quenching showed that the electron transfer is still more important in the covalently bonded hybrids than in systems where the POM and the ruthenium complexes are assembled via electrostatic interactions. B. Matt, S. Renaudineau, L.-M. Chamoreau, C. Afonso, G. Izzet, A. Proust, J. Org. Chem. 2011, 76, 3107-3112. A new series of polyoxometalate-based hybrids has been synthesized. These covalently linked organic-inorganic materials represent valuable elementary building blocks ready for postfunctionalization, using classical organic reactions and couplings. This approach is exemplified by the grafting of an organic chromophore via a Sonogashira coupling. S. Gatard, S. Blanchard, B. Schollhorn, P. Gouzerh, A. Proust, K. Boubekeur., Chem. Eur. J., 2010, 16, 8390-8399. Synthesis of electroactive benzothiazole hydrazones has been achieved and they have been successfully coupled to [Mo6O19]2- to give rare examples of diazoalkane-hexamolybdates. The molecular packing arrangements of the hydrazone precursors and the electronic features of the covalent organic-inorganic hybrids showing communication between the organic pi-system and the metal centers make these compounds very promising building blocks for the synthesis of conducting molecular materials. V. Duffort, R. Thouvenot, C. Afonso, G. Izzet, A. Proust, Chem. Commun., 2009, 6062–6064. A new polyoxometalate-based organic/inorganic plateform has been designed for further facile derivatization and covalent attachment of organic linkers. This is examplified by the grafting of a polypyridyl ligand. A. Proust, R. Thouvenot, P. Gouzerh, Chem. Commun., 2008, 1837-1852. Functionalization via covalent grafting of organic functions allows to tune the redox and acid–base properties, and the solubility of polyoxometalates, to enhance their stability and biological activity and to reduce their toxicity, to facilitate their implementation in extended structures and functional devices. We discuss herein the electronic and binding connections, and the various synthesis methodologies. We emphasize on organonitrogen, organosilyl and organophosphonyl derivatives with special attention to synthesis, characterization and potential applications in catalysis and materials science. We also consider the giant molybdenum oxide-based clusters especially the porous capsule-type clusters (Keplerates) which have high relevance to this context.